As an author my goal is to write stories that whisk the reader away to worlds of adventure; steep them in romance, and wrap them in a magical world—bringing to life a believable place and time through fictional characters and events. The website was created to further this goal and enhance the experience of my readers. An intuitive menu is included in the sidebar on every page and links have been provided throughout the website to make navigation easier. From the menu and links you can discover Maps and illustrations to follow the path of the characters and visualize important events. There are organized Character Lists & Glossaries to help keep track of the sometimes extensive cast. 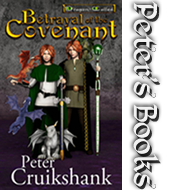 To make the books even more enjoyable there are Dragon Tails—short background stories on some of the characters and events. 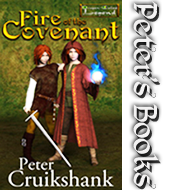 You can find out more about Peter Cruikshank’s books, preview samples directly through Amazon©, along with Reviews from other readers, and links to order from multiple on-line realtors or request an autographed copy. Return often to see the Latest News on my writing progress, book signings, discounts, the occasional blog post, and more, including an Author Q&A (Ask Peter anything).